Our company casuals catalog is an excellent choice for corporate apparel, uniform wear, outerwear, team uniforms and also for basic items like tees and sweats. Look for great brands such as Nike, Ping, Port Authority, District Threads and Hanes. From sport shirts to button-downs and jackets, with a nice selection of t-shirts and sweatshirts mixed in, this catalog has many choices to suit your needs. Take a look at our online version, or give us a call and we will make recommendations for you. To round out our online catalogs visit logocasuals to see our vast selection of polos, jackets, baby clothing, bags and fleece. Check out the great Devon & Jones and Adidas Golf wear to add to your collection and make a great impression on your game. Do you need help stylizing or adding to your design? 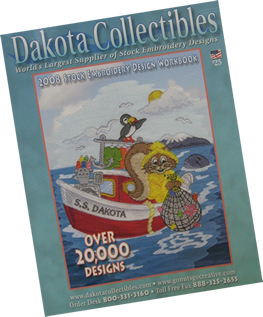 We have our online Dakota Collectibles Stock Embroidery Design Catalog for you to browse and choose the perfect company logo or a simple piece for a baby's bib. With over 20,000 designs to their line we know you will find what you are looking for. 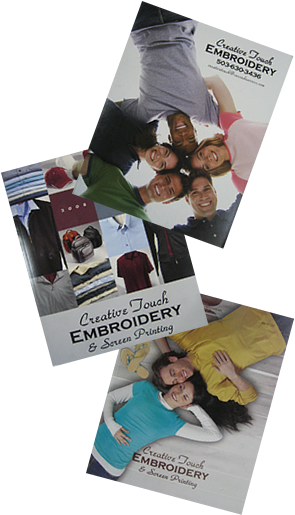 Each catalog here presents the best brands available to you through Creative Touch Embroidery. All catalogs are available to you in the mail by sending us a request via email or by phone.